So I was thinking about Judas. You know the guy who betrayed Jesus. We love to hate him and say, "Don't be that guy." And like Peter, we say, "I would never be that guy." Let me laugh quietly in the corner and say, "Everyone, we are often THAT guy." So here's Judas. He goes around with Jesus for a couple years and believes that this could be the MAN. The man who takes over the world, the man who gets rid of Rome, the man who sets up the Jews as rulers. The Messiah. And yet, while Jesus shows He has power to do it and that He's God, He just doesn't conform to the disciples vision of what the Messiah should look like. So what does Judas do? Judas tried to force Jesus's hand. You know, to force Jesus to step up, prove His power, take control of Rome. So Judas sent an army against Him, and it couldn't have turned out more wrong for Judas. Jesus surrendered and turned Himself in, and ultimately died. Crushed and defeated, Judas goes out and hangs himself, missing the resurrection and the whole point of the gospel. Judas tried to fit God into his box of what God should act and look like, and it didn't come close to his small picture, ultimately missing the bigger grandeur of God's plan. And don't we do the same. Truly. Yep. How often we...I... miss the point of the gospel. I have this thorn in the side. An issue that I wrestle with God, pray over, grieve over, ask to be removed, and ask by a few to be held accountable on. Some days I see signs of victory, and other days I wrestle with defeat. Why in the world, if God is God, wouldn't He just "heal" me from it? Take control, take it away, show Who. He. Is. And then I am missing the point of the Gospel. I hear Christians quoting scripture as if it's a "magic" potion book that will take away whatever conflict, disease, problem, or issue is plaguing them. And it's not that I don't believe God has the power to do it, or that He doesn't sometimes act that way on our behalf. But "staking a claim on this scripture" or "you just gotta have faith" as magic erasers that will rid us of our problems just sell out the gospel. At that point, we've put God into our box of how we think God would act if He was really God, and we have become just like Judas. What if God was still God, and shows His power the most when He sits with us IN our pain? What if we aren't healed? What if it NEVER goes away? Is God still God? Can there still be victory? What then is victory? And this can be possible in any circumstance? Even if the circumstance remains? When we have to cling to Him in faith that a transformation of the heart is what He has in mind for us, I think faith grows the most. I'm not so sure faith grows as much when we go to God and we don't have to cling, to wrestle, to struggle with who we are in our hearts. I trust in God's lovingkindness, and in the gospel, but the gospel is freedom of the soul. Not freedom from circumstances. That problem might stick with me until the day I die, but I am free. God does miracles everyday but the greatest one is the one within. Sadly, Judas never got to experience the gospel, the liberating freedom of the soul that stretches far above the liberation from circumstances in Rome. And this I think, is the greatest tragedy of all. 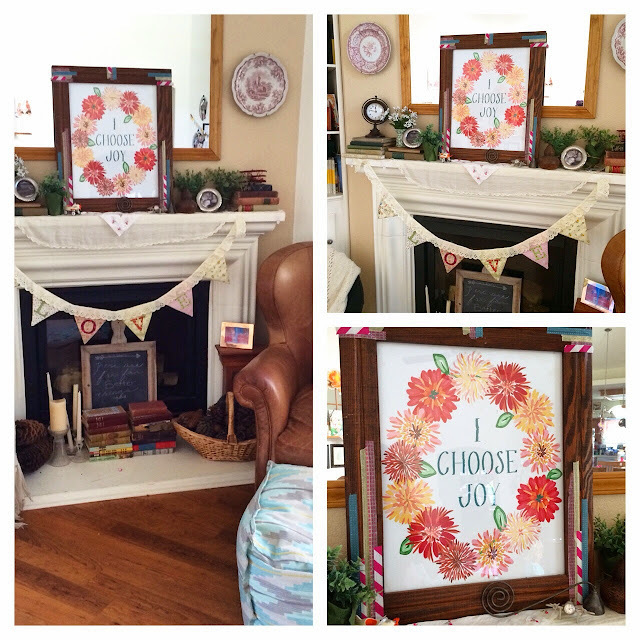 The new I Choose Joy art print on my mantle is from Little Life Prints. It's a reminder that victory can be had when I reach out to God and choose to lean in to the gospel.